We know that the foundation of any relationship between a patient and a care provider is trust. At Gwinnett Family Dental Care, we’ve built our entire dental practice in Lawrenceville around fostering and promoting that trust. We’ve made it our mission to provide the very best in comprehensive dental care, building relationships with our patients that last for a lifetime. We specialize in bringing a healthy, beautiful smile to the faces of everyone in your family. Whether you are trying to instill strong dental hygiene habits in a young child, or looking to correct issues plaguing your own smile, we are here to help. We have the experience and compassion you expect from the Lawrenceville area’s very best dental care providers. Our practice means we can also keep almost all of your care under one familiar roof, even if you find yourself or a family member in need of a specialist’s attention. No outside referral process means you are able to stay under the care of a practice you trust, in a setting with which you are already familiar. Your time is precious, so we offer extended hours from Monday through Saturday to meet all of your family’s oral care needs, even on the weekends. We’ve also made a point of building the Lawrenceville area’s most state-of-the-art dental facility to further increase both quality of care and efficiency. Keeping up with all of the most recent advances in dental technology is the cornerstone of our practice, because we are dedicated to offering you the very best care possible in a fast, effective manner. 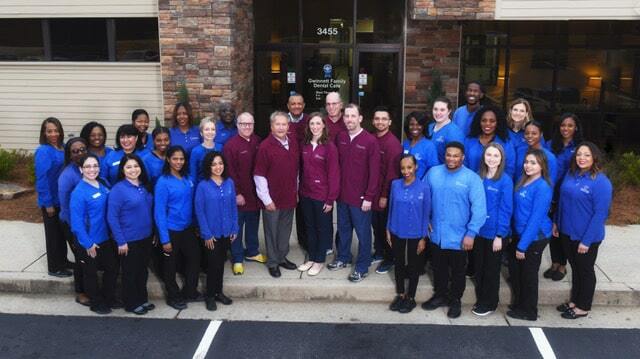 Contact us today for a consultation, and to learn more about the dedicated team of committed, highly-trained professionals who make up the team at Gwinnett Family Dental Care. We are confident you will find the right dentist for you, and look forward to offering you the very best in dental care that the Lawrenceville area has to offer.